The horses are off!! 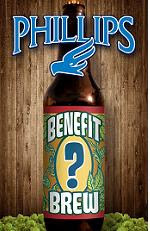 Vote for your favourite nominated charity once/day until September 23rd at www.phillipsbeer.com/benefitbrew. The chosen benefit will get a special brew named after them with full proceeds of sales going to their cause. Selected from many groups suggested by Phillips beer enthusiasts, the finalists include The Fruit Tree Project, Push for the Cure, Music BC,Victoria Public Market, Vancouver Is Awesome, Dhana Metta Society,Ancient Forest Alliance, Jest for Joy Clown Doctors, Sierra Club BC, and Intrepid Theatre. Online voting for the winning organization will run from Friday September 9th until September 23rd. The winning organization will be announced on October 1st with the beer expected in stores by early November.